I bought a lot of dice at Gen Con 2015. I bought a set for myself, a set for my wife, and a set for all three of my children. Then I bought some special dice for Fantasy Flight Games‘ role playing game, Force and Destiny. Two sets of those special dice as a matter of fact. Like many gamers, buying dice is a yearly tradition at the four best days in gaming. I also decided to finally buy some of the fancy dice made by Q Workshop, and as a fan of the Pathfinder Role Playing Game, I decided to pick up one of the dice sets for the recent adventure path, Iron Gods. The Pathfinder Dice Set – Iron Gods is designed to resemble the Numerian technology featured in the adventure path. The dice are dark, but the markings are light blue which contrasts well. No issues reading the numbers on these dice. They roll well, and I look forward to unleashing them on my players. All the dice are belong to me! 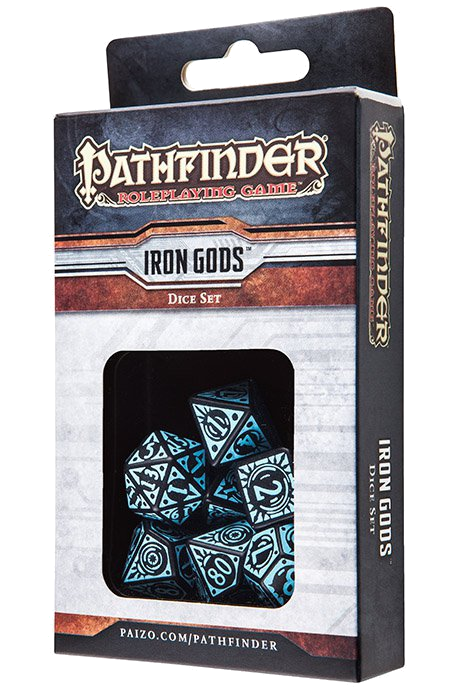 I give the Pathfinder Dice Set – Iron Gods a 5.0 out of 5.0.